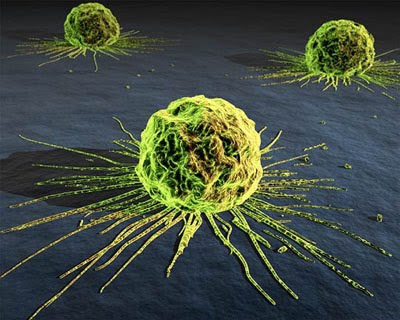 The truth about cancer and its origin. Interlocutor: Well, I’ll move on to the next topic that has to do with the treatment of cancer according to doctor Hulda R. Clark. This Australian doctor sustains that the best method to fight against cancer is by eliminating all kind of parasites of the interior of the patient's body. She says that one of them, Fasciolopsis Buskil, is the main responsible of cancer. She also considers fundamental to eliminate all kind of chemical pollutants, as much in the environment, foods and products of corporal use. She also speaks that the patients should remove dental amalgams and that they should change the pipes of their houses if they are made of copper. That they should eat only fresh and natural foods in order to avoid chemical pollutants. That they don't use deodorants or hair gels and they should live far from High voltage towers, telephonic antennas, etc. I have read all that the doctor Clark states and I was quite confused because there are some factors of her treatment that I find excellent, but I find others completely insane because they hurt common sense. And if truth and common sense have to go together, here in some things they are totally separated. What I mean is that this doctor's method could be in common words something fishy, Am I wrong? Ruanel: Correct. This technique is false because cancer in the immense majority of the cases has a genetic origin. It is an indiscriminate growth of cells since they lack of the necessary protein in their membrane to prevent such cellular growth. Interlocutor: Are you speaking of a protein? Ruanel: Yes, because what prevents cells from reproducing indiscriminately is a protein. When the cells lack of this protein, they reproduce in a indiscriminate way forming tumours. Interlocutor: But that doesn't have anything to do with parasites or polluting elements! Ruanel: Of course not. This doctor's theory is nonsense. Interlocutor: I already thought so! Even following her treatment literally and living in an island or an oasis, cancer would still be there! Ruanel: Exactly. It’s understood that the more detoxicated the organism is, the more perspective of physical life a person can have. Interlocutor: But that’s totally a different issue! Interlocutor: I want to remember something here – that you said in a previous session - so that those who are not aware of it know about it. When cancer is genetic, it has a karmic origin and it is the spirit the one who chooses to embody in an organism predisposed for that illness in order to learn pending karmic lessons. Ruanel: Yes, it’s correct. I want to add that the state of mind of embodied beings produce endorphins and these endorphins make the body improve and it prevents that cells grow indiscriminately. Sometimes, when the body is fine, without stress, these circumstances can be healthy. Interlocutor: Summing up your explanations, so that there is no doubt, the method of doctor Clark does not fight against cancer because it is genetic in most of the cases and it cannot be like what she proposes, but it can help the person to feel better in spite of their suffering. Interlocutor: And it doesn't have anything to do with the cure of cancer. Ruanel: It is also correct. Interlocutor: But this is nothing new because all the doctors and all the philosophers have said it since ancient times and even grandmothers in all ages! Ruanel: The method proposed by this person, indeed, doesn't have something new. Interlocutor: Then, Is it nonsense if one considers that the origin of cancer could be caused by parasites or polluting elements? Interlocutor: If my memory serves me well, here in Argentina, at some time there was a treatment using snake poison, I believe that the medication was called "Crotoxin." Something that provoked a tremendous polemic. I’m not aware of what happened with the medical community, but I believe that it was something useless. Ruanel: Snake poison provokes a good effect in the human being's blood because on one hand, it produces certain toxins and those toxins- it’s worth repeating that- although they intoxicate, on the other hand, they can also prevent the indiscriminate growth of cells. Interlocutor: Was Crotoxin a valid medication? Ruanel: It wasn’t the panacea, but it was valid because it helped. Ruanel: Of course and a cancer of genetic origin can even be worsened also by engrams and ego. Interlocutor: I understand. In one of the previous sessions, I believe that when we talked about AIDS, you told me that the cure for cancer already existed. Ruanel: Yes, of course that it exists, at DNA level, and they are hiding it in the same way they hide the cure of AIDS. It’s a matter of common sense. If all incarnated human beings realize that it is possible to decipher the genetic code, they also have to recognize that modifying the DNA chain of each cell, the chaotic reproduction is prevented, therefore cancer is avoided. With AIDS virus happens exactly the same thing, it can be perfectly transmuted modifying an axis of its DNA chain. Interlocutor: But doesn't everybody know that? Ruanel: Everybody who knows a little bit of chemistry should know that! Interlocutor: You said that cancer takes place due to the lack of a protein. Ruanel: The lack of that protein is the one that allows cells to grow up indiscriminately and to multiply exponentially. Interlocutor: The treatment of cancer, then, consists on injecting the lacking protein to the person? I ask this, obviously, because I ignore what the correct question would be. Maybe the one who knows something of this matter would consider my question absurd! Interlocutor: At this time I remember the anecdote of the man who invented chess, he requested as a payment a grain of wheat for the first square of the board, two for second, four for third and so forth arriving to the square sixty four. The amount of wheat was so humongous that there was no such amount of wheat in the Kingdom to pay him! Ruanel: The anecdote is valid. Interlocutor: Then it has nothing to do with injecting the missing protein to stop the reproduction of cells? Interlocutor: I understand. Does a person with karma have all the cells that lack of that protein, in order to learn pending lessons? Ruanel: No, the lack of protein happens in some cells only, not in all of them. Interlocutor: In some cells only? Ruanel: Sure because that type of proteins are characteristic of each cell and, as I already said, they are like a kind of key that prevents the massive proliferation. But the same thing happens when the woman gives birth to a child. Why does the ovum allow that only one spermatozoon pass and no more? Because directly there is like a "click" that closes the ovum wall so that a second spermatozoon doesn't enter. Interlocutor: Does the missing protein have a similar function preventing the massive proliferation of cells? Interlocutor: What I don't understand well is this: Let’s suppose that in a certain person they detect the lack of that protein in advance. Isn’t it possible to inject that protein in order to avoid the future cancer somehow? I repeat that my question can be absurd for he who knows about chemistry, but I ask it, maybe in a very elemental way, so that you answer it. Ruanel: No, I repeat what I said before: what is necessary to do is correct the DNA system once this correction has been made automatically that protein is generated. Interlocutor: End of the topic, now I understood perfectly! Ruanel: What happens is that this correction is much simpler than imposing something to the cell. The cell doesn’t need any imposition because it is enough to correct its DNA chain so that the cell automatically creates that missing protein. Interlocutor: And with that procedure cancer would be cured? Interlocutor: End of the topic! Interlocutor: Fine Master, with a lot of important questions, the topics I hope to talk about are ample, if you have time and if the vessel resists we’ll deal with them, since he has a cold, we’ll talk about the so-called Germanic New Medicine which is so polemic, the always questioned Homeopathy that nobody knows for sure if it’s science or not and finally about Reiki, which is also similar to the other two. Ruanel: Don’t worry for the vessel if he collpases I’ll continue transmitting. Interlocutor: Master, you don't waste a chance to make a joke!... But, you are right, if Jorge collapses we’ll continue likewise. Can we start? Interlocutor: The first question is related with the so-called "Germanic New Medicine" (GNM), created by doctor Ryke Geerd Hamer. His story, narrated concisely explains that in 1978 the loss of his son in an accident was the key event that developed his theories about cancer. I believe that he died after four months of that accident. The question is: After two months the doctor Hamer and his wife developed cancer, he had cancer in his testicles and his wife had cancer in her chest, at first he attributed the origin of cancer to the conflict provoked by his son’s death. The concrete question is: Did the spirits of error influence him or directly it was a distortion of the messages of the Spirits of Light? Ruanel: They were spirits of error of the plane 2. Interlocutor: So there was no influence of Light? Interlocutor: Did cancer take place as he said due to his son's death? Ruanel: Sometimes, an emotional state can affect the physical part - if it affects the auric part, it also affects the physical part -, but a DNA problem not necessarily has to be reflected by an emotional field. Ruanel: What I mean is that in the case of these people, the cancer was produced because they were already prone to it. Interlocutor: I understand. The death of their son was like a trigger that made evident something that was already in them? Interlocutor: But then, their son's death didn't produce cancer! Ruanel: Exactly. Cancer was already in them. Interlocutor: Always with the spirits of error behind? Ruanel: The spirits of error act because when there is something that has not been proven, until it is not perfected, many people will always be used as guinea pigs. And the spirits of error take advantage of that because in that way they give free rein to their cruelty. I translate it: "to give free rein to their cruelty" means that the bigger number of victims there are in the investigations, the more they enjoy. Interlocutor: Excuse me if I insist, Master, but I want to have absolute certainty that the theory developed by doctor Hamer doesn't have any validity at all. I ask it because the doctor Hamer himself and other investigators that have studied his theory – and I don't refer to detractors obviously - they said that the biological laws that are integrated are fulfilled completely in all the occasions. Ruanel: It is a total nonsense. He has nothing demonstrated. There were people that have reverted part of the problem they had with conventional treatments, and even with “placebo effect", but nothing else. Interlocutor: As I see, it doesn’t make any sense insisting on this topic because it’s not worth it. I see that the doctor Hamer's theory doesn't make any sense. Interlocutor: However, I’d like you to make a short summary to highlight its useless. When I began reading Germanic New Medicine, I remembered Dianetics. I mean, although it doesn't mention the reactive mind or engrams, somehow it was related to conflictive fact with and an illness that is to say, an engram with a dysfunction. Ruanel: I would define Germanic New Medicine like an encouraging theory that created too many expectations that due to its falsehood generated karma to the author and engrams to those who expected a solution to their problems. Interlocutor: This is clear. Did doctor Hamer give some solution, rather some alleged solution, to solve the conflict about cancer? At this time I am comparing him with you, in the sense that your discoveries on the reactive mind when you were embodied were also supplemented with the technology to remove engrams. Of course that we know that emotional conflicts don't produce cancer. Ruanel: That’s right. I ratify that emotional conflicts don't produce cancer. Cancer can be originated by engrams - psychogenic engramic illness - or due to a genetic factor of karmatic character. Then, if certain cell has a different programming, it will degenerate and the cellular reproduction will be chaotic and that will form different cancerous cells. The cell usually has a DNA programming that multiplies exponentially: 2, 4, 8, 16, 32, 64, 128, 256, etc. In this case the cancerous cells grow in indiscriminate way, its Gene is completely dysfunctional, and it can even cause the death of the person. And that is not necessarily due to psychogenic dysfunctions, but rather they are problems of karmatic origin that directly affect the person's genesis. Interlocutor: This doctor is prosecuted by the law, but beyond that his theory is senseless, the question is if it is because he has committed a crime. Ruanel: Yes, it is correct. From the legal point of view he is a felon. Interlocutor: Concretely, he is not prosecuted for his ideas, but because he made an illegal Medical practice. Interlocutor: Is it true the case of Olivia Pilhar, a girl who had cancer when she was six years old? Olivia began to be treated with chemotherapy, but her parents, convinced by doctor Hamer, refused that she continues her treatment and they decided to treat their child according to Hamer's new medicine. The child was finally given emergency medical treatment in Vienna after a court order against the parents' wishes. Fortunately, the intervention of Austrian doctors and the Austrian president were able to help her. When Olivia entered again in the hospital, the cancerous already weighed several kilograms. Luckily, a chemotherapy treatment saved her life. Is this story real? Ruanel: Yes, It’s true. Traditional medicine, in some of the illnesses still leaves much to be desired. In spite of the great medical advances it has a lot ahead. There are many problems that the human being has not solved. There are illnesses that have not yet been cured and that have a very old origin, like diabetes, to give an example. Or different dysfunctions like epilepsy that should be already curable at this point. What I’ll give you now is a scoop for Grupo Elron. There is an apparatus, which is in theory stage - where else if not in Japan? - that consists of a helmet with electrodes that can read the brain with a computer, like a electroencephalogram. Interlocutor: Is it only for reading or does it have some healing properties? Ruanel: Many years ago on this planet, this helmet has been invented and what it does is to correct, from outside to inside, the electric circuits that are bad in the mental decoder. Interlocutor: Are they doing it already? Ruanel: No, at the moment it is only a theory. Ruanel: Yes, of course it is. And it can end up modifying, in some way those mental decoders that have problems of short circuits, the electric triggers that are in excess. Interlocutor: Like in the case of epileptic seizures? Interlocutor: Wonderful!... Returning to the topic of doctor Hamer, Did this doctor only speak about cancer or about all the illnesses? Ruanel: In fact what he said is that all illnesses are originated by internal conflicts. Interlocutor: And Isn’t he right perhaps? Ruanel: If we wanted to be very subtle, we would say that he is right. But with that approach the whole humanity could be right with the phrase that says: “faith heals" for example. We know for sure that faith doesn't heal, but certain light illnesses can be reverted by means of "placebo effect"
Then, it is obvious that is very easy to take the story wherever you want. Interlocutor: I understand. It is like the cunning lawyer that made a story up in order to be right. Ruanel: Correct. If we speak correctly, we know that there are illnesses that are; either engramic or karmatic that don’t have anything to do with emotional problems. Interlocutor: But the doctor Hamer designed some technology? Does he have some solution to the alleged origin of cancer or he had only the theory of the alleged origin? Ruanel: What solution will he have if he has none? He only had the theory that the origin of cancer was caused by an emotional conflict. Interlocutor: Concretely, he outlined a false theory and on the other hand he left it there, without giving any theoretical healing technique? Interlocutor: There is something that I don't understand well. You in 1950 published the book Dianetics, the modern science of mental health, and millions of copies are still sold nowadays. On the other hand, doctor Hamer, starting from 1978, the year his son died, three decades later he developed his theory doing it without considering the discoveries on the reactive mind and engrams. It doesn’t make sense. Doesn't a serious investigator have to be aware of all the revolutionary advances? and even more about something so revolutionary as Dianetics? I would compare it to somebody who tries to make fire with two sticks when matches were already invented. Ruanel: He ignored it because of his ego. Each one wants to have his own theory and to be the only owner of the truth. Interlocutor: But there is a very big difference, Master, and it is that you demonstrated each axiom that you postulated scientifically and it is known that all the organizations of the world send to the central in United States the documentation of the successes. Ruanel: Correct. If you notice humanity's recent history, most of the people are dragged by elementary, very basic theories. On the contrary, the well sustained theories drag very few people. Interlocutor: The most surprising thing is that Dianetics and Scientology have not yet reached to Medicine. Ruanel: With religion happens exactly the same thing! The more basic the religion is, the more people it will drag, because people are having little understanding. There is a prevalence of reactive mind, and we know that reactive mind doesn't think. The automatic reactive mind has zero thinking, and the impulsive reactive mind, although it is controlled by egotistical patterns, you cannot compare it with the analytic mind. "You asked several times if this protein stops the cell growth, and the Master Ruanel responds that it is fixing the DNA chain, It’s clear then that the cure of cancer is related to DNA. But I emphasize the following sentence: "That protein is like a key that prevents the indiscriminate cellular proliferation. The lack of that protein is the one that provokes cancer. Cancer is generated only when that necessary protein is missing (leaving aside the egotistical and engramic case) in the body. Logically, if a person had that protein, he/she would not have cancer. If this is true, according to the answer of the Master Ron, it would be only necessary to watch the amount of that protein in each person to avoid that cancer be generated. For that reason, I’d like to know what protein is the one that prevents cancer. I emphasize that we are speaking about preventing cancer, since we know that the cure of cancer is only possible by modifying the DNA. Without considering the egotistical and engramic cases." Ruanel: Biologists know very well the protein which enzyme is the one that has the key so that directly the cell multiplies or not. What happens is that at the present time the treatments used for cancer are, as you would say in the physical plan, "in diapers." There is a long journey ahead. Ruanel: Yes, but I also said that in order that the cure will be at close hand, dozens of years would pass. Interlocutor: Is it because they hide it or they still have many discoveries to make? Ruanel: Without leaving the topic, there were also laboratories that modifying DNA have prevented that AIDS retrovirus multiplies and invades cells. However, there are many vested interests at commercial level for all the remedies that exist to cure certain problem - in the case of cancer, for example with chemotherapy- first-class social works and sanatoriums are involved and they are not interested that a simpler solution be known massively. This is one of the reasons. There have even been five mysterious deaths, two in Switzerland and three in Japan, of scientists who were investigating new vaccines and they had their laboratories destroyed. Interlocutor: I suppose that with “mysterious deaths” you are implying that they were murdered. Interlocutor: Is there a mafia, then, inside of Medicine? Ruanel: Of course How won't it be? Interlocutor: It is incredible, the less that one expects to think is that there is mafia in that environment. What is the name of that protein that prevents the multiplication of the cell indiscriminately? Ruanel: The name of the gene is Z-3. Interlocutor: Is that the name of the protein? Ruanel: I am giving you the name of the gene given by a biologist in Switzerland. I simply repeat it. They call that gene in that way. Interlocutor: Let’s see if I understood. Let’s suppose that I am a healthy person that doesn't have cancer. What can I do to prevent cancer in the future? Is there a way? Ruanel: The only way is that you be emotionally balanced and that you don't affect yourself at placebo level. Ruanel: Yes, because placebo effect can also be against you. It is what you call in the physical plane like hypochondria. Interlocutor: Are you referring to those healthy people that provoke illnesses to themselves? Interlocutor: I don’t prevent cancer, then, by injecting that gene "Z-3?" Ruanel: No, not at all. The technology is not advanced for that yet. Interlocutor: But in the future, with the appropriate technique, could it be the way to prevent cancer? Ruanel: It could be one in the ways. Interlocutor: Do you perceive that the cure of cancer has been achieved in other planets? Ruanel: But of course yes! In other planets there are other types of virus and retrovirus that have already been defeated. Interlocutor: Would it be clarified the question that Abraham G. asked? Ruanel: Yes, but I will repeat that there still is not a massive cure for the problem yet, but in future there will be a cure. Interlocutor: I believe that the matter of Germanic New Medicine is very clear. Do you want to add something more? This entry was posted at Wednesday, June 02, 2010 and is filed under Therapies . You can follow any responses to this entry through the .